Tropical Fruit Discussion / Re: What would be a good companion for my Peach Cobbler Tree? BSBullie says a Phoenix tree that big is suspicious because of the length of time the variety has been in development. That guys knows more about Mangos than most of us ever will and I trust his views even though he has hammered at me before. The tree is CLEARLY in front of a sign from Fruitscapes. How else do you explain that tree being in front of Fruitscapes? ? Did it just grow legs and walk there on its own? Maybe hitchhiked there? Maybe you should open the picture up and use your eyes instead of telling me to keep my mouth shut and look at the picture Gosp posted. I'm not trying to troll anybody or make any allegations but if I see a picture of a recently purchased tree in front of a nursery I would think the tree is purchased from that nursery. Logic. Gosp - if you didn't purchase the tree from Fruitscapes I apologize but even your edit says "I was told I got the authentic Phoenix unless something is cooking" so you admit something could be up. Many people have been burned here buying one tree and getting another from various places and from what I've read I will take BSBullie's opinion on a Mango tree variety over what a nursery tag may be or say. BSB - Please look at the picture - the sign for Fruitscapes is in the background of the photo !! Fruitscapes may not have shipped the tree to him but their sign is 100% in the background of that photo. All i did was click on the photo and opened it up to get a better look at the tree and I saw the sign. Maybe Fruitscapes doesn't ship to California but he clearly said that was a picture of his tree. Tropical Fruit Discussion / Re: How to get rid of peach tree leaf spot? I would fertilize every other week with a pound of fertilizer. OP - not to take over your thread but I want to thank Achetadomestica for the info on peaches being heavy feeders. I have a three year old (in ground 1 year) Florida Prince peach. I started a heavy fertilizer regiment after reading the posts on this thread and the tree has virtually doubled in size. The leaves have gone from a lighter green to a beautiful dark green color. The growth on that thing is nothing short of amazing coming close to doubling in size. I appreciate the tip. That was Rob but the fruit was taken from the mother tree I believe and am pretty much sure of. These grafted trees are different animals. It is an amazing tree, very healthy and vibrant. I will let mine fruit one time to prove if it stays or gets the ax. Do not need multiple years to tell if it has value! I should have let my 15 gal Phoenix hold fruit this year to evaluate. Good thing i havent planted it in-ground. It may or may not improve flavor here in our dry California weather. 15 gal Phoenix??? It was just released about a year and a half ago, how big could it have been in a 15 gal pot in California? This is what it looks like b4 it was sent to me last year. It also looked to be in no condition to hold any fruit. Simon - ouch - so sorry for that loss. Can they be salvaged at all - maybe into smoothies even? Future - I'm in Longwood - so about 2 minutes away. Big YES from me if you do it - then I just gotta talk you into sharing any of the seeds that are Poly . Can't do it this Saturday morning / afternoon as my son has a soccer tourney but any other date let me know. So - I got a gift in the mail from Orkine - a box of mango's he grew. My boys and I had a chance to try 3 varieties so far. Carrie - Glenn and Choc-Anon and we have a few more left to ripen up (a Tommy Atkins and Mallika). The Carries were a bit soft but thats because our friends at the Post Office didn't treat the box, shall we say, with care. Excellent mango. Next up was the Glenn - just fantastic, but then we tried the Choc-Anon. OMG - the Choc-Anon are just amazing and simply the best I've ever had - topping the sugar cookie variety I had 2 summers ago. One of them even had a bit of a butterscotch flavor/profile - and the smell is just heavenly. I cooked ribs for dinner tonight and after cutting the Choc-Anon's they overpowered the rib smell in the kitchen. Just amazing. Orkine - just can't say thank you enough for that package. Does it cure cancer too? No - but I've found I have a great hair day everytime after releasing the flies. Sarcasm aside, would love to know more about this if there's anything to it. Cuttings arrived in the mail today and are very large and in great shape. Thanks for throwing a few extra in - now off to Home Depot for more pots. So last night around 6pm after seeing the forecast was 10% chance of rain I went out and mixed up some southern ag spray that contained the minor elements and sprayed the new flushes on my Mango trees and also hit my citrus trees as well. So yeah, the 10% didn't hold up and we had a good inch of rain which started around 830pm or so. My question is do i need to respray tonight, or did the 2 hours provide enough drying time for the leaves to soak in the benefits of the spray? Also - wondering if i'm betting doing a root drench too considering its raining, well, every day as most of you know. Orkine - actually not trolling him at all and a big thank you for your PM to me. Sometimes I'm just a bit naive and I'm sorry I got him mad at me. People higher up in the thread were talking about their grocery store finds and I just talked a bit about what I found locally here. Coming from Buffalo, New York, snow capital of the world where the best price we ever saw on mangos was 3 for $5.00, after moving to Central Florida and starting to learn my way around a bit (and a huge thanks to all here that i've learned from), i honestly thought i was contributing something. Had no intent to take away from the original poster or get bs mad at me or was trying to troll him. I look up to him and all the other more experienced folks too numerous to mention for their feedback and especially their answers when I've had questions. I unfortunately haven't had a chance to take a trip down to South Florida for this mango season and with work and all I'm not sure I'll be able to so to bs, the OP and others at the event please take my apology. Didn't mean anything by it. I started using a granular slow release 6-4-6 store brand from Home Depot in the orange bag. Bad mistake as the granules got stuck in the leaves where they attach to the plant and the leaves burned badly. While that was fine provided i made sure i put the granules down only on the sand/dirt, when i broadcast them one day to speed things up - well, that didn't work well. Now, don't laugh, plain old miracle grow knock-off formula from Lowe's. I put 2 of the small scoops into a 2 gallon watering can and fertilize every 2 weeks. I use 6 gallons of water and 6 scoops of fertilizer in the bed now. I'm attaching a picture from February to see what the difference is. The ground they're in is just dead sand. I had Gardenias in the bed that were sickly - just nothing going on with them. As i started adding fertilizer around the pineapples the Gardenias bounced back enough for me to transplant them out of the bed that bed as I made the entire area a pineapple patch. One thing to mention, those twist-offs will sometimes get serrated leaves. Probably 10% of the leaves in the patch will rip you up big time if you're not careful. Nothing better than free. Over 60 pineapples growing all of them from twist-offs. Started planting the twist-offs in March of 2017 and have had a 90% take rate just by putting them into the ground. I have fertilized them a few times and they're under two large palm trees so they get a good amount of shade every day. No signs yet of any flowers coming out but I have probably 4 or 5 plants that are bigger than the others that I think will produce this year for me. Fingers crossed. If not - nothing ventured nothing gained as they were free. Great mango reviews by the original Broward taste testers. What did you eat for the interludes to take away from the mango tastes? So you could taste (savor) the next mangoes better? I don't think you can compete with JF's mother when JF throws a Los Angeles mango do. On any given Sunday, an inferior but ripe backyard mango is better than a store bought mango. This is 85% true. At Aldi yesterday they were selling large Florida mangoes. 59¢ each. Hard but red and colorful. Publix also usually brings in real Fl mangoes this time of year. Broward meat and Fish must have too. Anyone who buys from Aldi Publix, let it sit for a few days, let us know how it pans out. Aldi also has the ripest looking Lake Chelan cherries for $1.79/lb. I abstained due to local mangoes. I track cherry prices and back in 2004 the first cherries of the season were $2.39 or so and would sink back to $1.99 as they flooded in and improved. Hass prices are also down due to many Mexican plantations coming on line. Getting Hass avocado on the East Coast used to mean it was California grown and more expensive. Mexican grown going for 49¢ twice within the last month. Publix mango's have been too pricey - not worth buying anytime of year. Winn Dixie's had mango's as low as 50c but they were very, very small and they were from Mexico - no variety listed. They were rock hard but very colorful - lots of bright red colors and attractive but I've stayed away. Safeway in Altamonte Springs had some very large Tommy Atkins in that were excellent. They took almost a week to soften up but when they did they were great. I paid as little as 59c and as much as $1.00. These were the best of the regular mango's that I've had. Fancy Fruit has had mangos from Florida, Dominica Republic and Atalufo from . The Florida mangos are sweet but very "washed out" and have been going for 79c to 99c each. The fruit almost looks striped as many are leaking juice from the top. The D.R. looked like a large Atalufo but were greener and much, much larger - those have been priced $1.19 to $1.39. It was spicy and sweet and had a lot of piney taste close to the skin. The regular Atalufo have been just fantastic. Sweet and complex tasting. Some of the best Atalufo's I've had. They've been $1.00 to $1.19. Whole Foods has had Florida Mango's but they're Organic and way too expensive so I haven't tried those. They also had Atalufo's at $1.00 each. Those Atalufo's have been very sweet but not complex. Also many of those have had aborted seeds so the husk on the inside of the fruit has been tiny - a lot of fruit since the seed casing is small. I've got over 50 pineapples growing in my front yard (nicely hidden by the shrub so hopefully when they start blooming no thievery). I have close to a 90% success rate just by sticking the tops in the soil. All of these in this picture were just twisted off and put into the ground. If they don't grow in the middle (and of the 90% take rate almost 90% of those grow in the middle even if the leaves easily pull out), then they throw off 1, 2 or 3 shoots from the sides like this. Heck, i've even taken pineapple tops that i cut into quarters and got the quarters to grow. The ones that i quartered are the smaller ones in the picture. I started putting the tops in the ground last May - so the bigger plants in the picture are around a year old and as you look into the picture the further down the row you get the younger the plants are. There's a fancy fruit market in our area that normally sells them for $2.00 or $2.50 each and I pick up one a week. If the price is more than $2.50 I pass. A few weeks ago Save-A-Lot was selling them for 99 cents so i bought 4 of them that week. I will keep adding by putting the tops in the ground until production on my home ones start then I just use those to grow new ones. That being said, if i could get my hands on another 50 or 100 tops for free then i'll put them in the garden between the tree rows very similar to the way pineislander is doing it between his DF's. And pineislander, may i add that picture looks fantastic. Longon and Jakfruit? Those are super sensitive unless you guys have a different kind of frost than we do. Even a light frost will fry the leaves off both of those. -Lychee likes a bit of cooler weather. -lilly pilly- mine did fine with heavy frost. These are my observations from my yard anyway. I am 9B and we had a fairly cold winter this year. 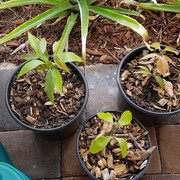 I have other things like Mangos, macadamia, and some various Eugenia that survived but did not survive well, even the light frosts. My Longan seedlings did fine in the cold and I'm in Longwood (Orlando) area. I took them in when we had the mid 20's temp but the frosty nights at 30-35 were fine. They are cats eye seedlings if that makes any difference. Tropical Fruit Discussion / Re: I Finally Found A Good Use For Pitangatuba Fruit - What's Yours? How about with Vodka or Tequila? I started 12 of them about a month ago in red solo cups. Of the 12 seeds I had all germinated but something went wrong five of them as they died right after pushing through the soil but by the looks of it something may have eaten them. I gave two of them to a neighbor and have 5 left as two of the pots have a double and one of the pots here is a single. I will take Simon's previous recommendations and graft the two together when they get a little bit bigger so i have 2 tap roots going down and a better chance to flourish and after I end up with a double root stock I may try to graft a named variety. I have no idea what type the originals were except they were incredibly juicy, tasty and organic and came from the Whole Foods in Atlamonte Springs, FL. I don't mind waiting 5 to 8 years for a seedling to produce but with these guys possibly taking 20-30 years, well, thats a bit much. Good luck and keep us up to date on the results. That's dinner man. Skin it and eat it. Don't waste good meat that mother nature provides. Tropical Fruit Discussion / Re: Dragon fruit germination - amount of light? I germinated a bunch of the large yellow df a few months ago - not sure if they were hylocereus megalanthus or not, but they all sprouted within 2 or 3 days of planting. I thoroughly washed all of the seeds before i planted them. They were not planted deep - only a trace of soil on top. It was a bit chilly outside when i planted them so i just left the cup sitting on the kitchen counter while they were germinating. That area has almost no natural sunlight and very diffused light from the bulbs i use. I also sprouted "regular" white dragon fruit seeds before and they also came up in a few days - so my experience has been that the seedlings show quickly. Tropical Fruit Discussion / Re: Let me present you the Pitanga cultivar "Regina"... my best Pitanga! Does it come true to seed? I would think not - but then getting grafted trees // scions are you going to try to release this just in Europe or all over the world? Having no seeds (while the birds may like them) certainly can be a big advantage. If you check out the local craigslist I've seen a few people selling Jaboticaba plants - they're more towards seminole county than over by you in Titusville but not a terrible drive / distance.